The Coolest Meditation Ever hosts ‘Movie and a Meditation’ on Saturday at 7:30 -- an evening of personal and collective healing through conscious film, music and meditation. 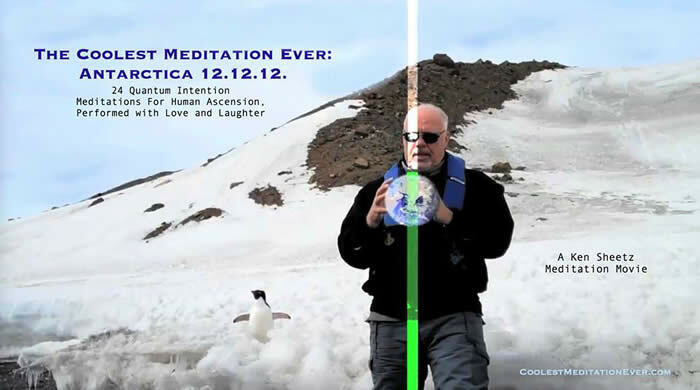 The documentary feature, The Coolest Meditation Ever: Antartica 12.12.12 will be screened, hosted by visionary filmmaker Ken Sheetz. After the film, the group will share an interactive toning and guided planetary meditation to bring healing and heart resonance with Mother Gaia, shared by the film’s co-producer. Previously screened and highly recommended films! http://www.theamazingyoutour.com/ for information on the screening ! Tickets are $15.00 and will be available in advance beginning January 1st 2015. Producer Dragos Bratasanu Ph.D. will be available for discussion immediately following the film . For information on the film or to screen in your area, please contact Kathleen Malone 602.799.1617 or email kamalone7@cox.net. Drawing from his experience as a space scientist, combined with state-of-the-art discoveries in leadership intelligence, Dragos bridges the languages of science and spirituality to support people discover their wonderful potential locked within their minds and hearts. Self-Empowerment through The Amazing You! In this internationally acclaimed feature film with Gregg Braden, NASA top leaders, visionaries from Stanford University, award winning entrepreneurs, New York Times bestselling authors, Angry Birds, rock stars, astronauts and polar explorers offer you over 30 years of personal wisdom that empowers you to create authentic success and fulfillment. Because this movie exists, many of us will never again have a broken heart because our dreams seem out of reach. For the first time in the US, we present, THE AMAZING YOU film, a breathtaking journey to success and personal transformation, already inspiring thousands of people worldwide. In only four months since its release, the film has been translated in 14 languages by volunteers who recognized its profound value to transform and inspire people. In a private letter to the producer, a university professor from Syria declared "this movie will encourage students to work better, with more hope for the coming future because a lot of them became hopeless after the difficult years of war". That's how powerful this information can be in your life. You will never again have your heart broken because your dreams seem out of reach. Inter-parliamentary Space Conference which was held in the Belgian Senate. Your contribution to the debate was really appreciated. "I was seduced by Dragos' ability to go to the point and lead some of the activities of our program. He is an exceptional creative and forward thinking fellow who knows how to foster cooperation in a group and produce excellent results. He is an absolute professional it is a joy to work with him." Join filmmaker, Ronna Prince, for a special screening ot this film followed by a discussion and Q&A. This film was an Official Selection of the Sedona International Film Festival 2013 and the LA Femme International Film Festival 2012. Discover how scientific findings are converging with ancient spiritual traditions to create the shift we’ve all been waiting for! Tickets $10.00 pre-sale or $15 at the door. 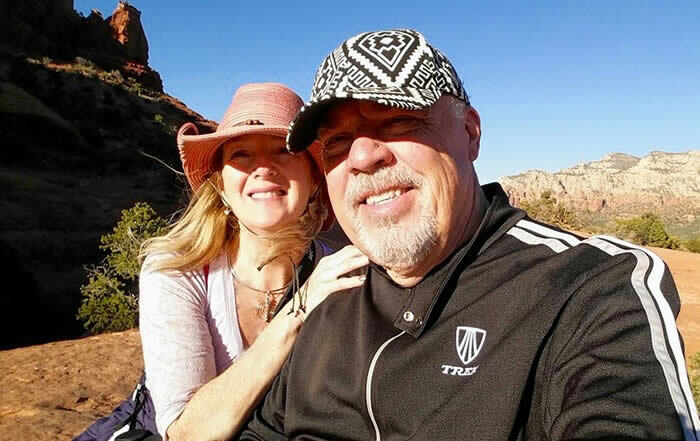 at Crystal Magic Bookstore in West Sedona or The Worm Bookstore in the VOC! 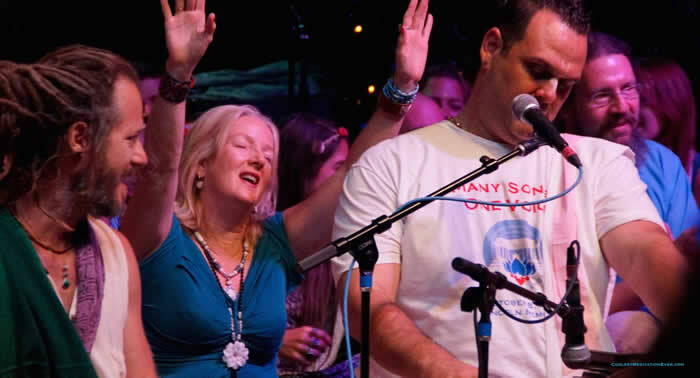 Writer, producer, filmmaker and visionary, Ronna Prince, devoted three years of her life to make “Sacred Journey of the Heart ”, a ground breaking film documenting the science, spirit and healing capabilities of our heart, proving that we are all connected to each other and the earth around us. Featuring respected visionaries and spiritual leaders such as New York Times best selling author Gregg Braden , Dr. Joe Dispenza , Dr. Deborah Rozman CEO of Heart Math , Uqualla , Sarah McLean , Cynthia James and Sunny Dawn Johnston. Following the screening, Ronna Prince, will host a Q& A discussion. Good movies are based on the successful attempt to tell a story. PEOPLE v. THE STATE OF ILLUSION takes you further, by making you a part of the story being told. This film by Austin Vickers questions the very nature of reality, and through an examination of our perceptions, beliefs and illusions, makes you both judge and jury in what will be the most important trial you will ever witness. This must-see psychological movie includes, as expert witnesses, some of the nation’s leading thinkers in the fields of neuroscience, biochemistry, psychology, quantum physics, and consciousness theory, including: Dr. Thomas Moore, Dr. Candace Pert, Debbie Ford, Dr. Joe Dispenza, Dr. Robert Jahn, Dr. Peter Senge, Brenda Dunne, and Dr. Michael Vandermark. Join us for this "one night only " screening ! 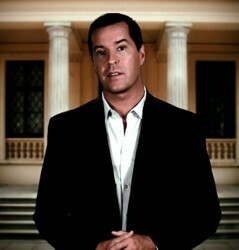 Author/Producer Austin Vickers, will host a discussion/Q & A following the screening. Tickets:$15 in advance at Crystal Magic and the Worm Bookstore. $20/at the door. 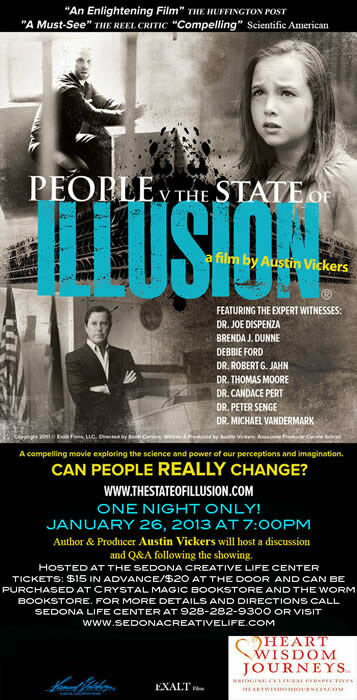 On September 9, 2011, People v. The State of Illusion, premiered at Harkins Camelview in Scottsdale, AZ to a sold-out audience. In its first month, it was the highest grossing independent film in Arizona, and its revenues per theater average put it in the top 5 films overall in the entire country. Writer and Producer, Austin Vickers, began writing People v. The State of Illusion in 2009. The movie was originally intended to be a PBS Television special showcasing the ideas of speaker and filmmaker, Austin Vickers. With concept in mind, he hired Jeff Halperin from Zen Media to travel with him across the country and film some of the leading scientists, philosophers, and thinkers, in the fields of neuroscience, physics, psychology, biochemistry, and consciousness studies, whose work at one time or another had all had an impact on Austin’s beliefs. Eight interviews later, and with over 30 hours of documentary footage of some the most amazing and insightful dialogue, Austin knew he was on to something special. But having been a successful speaker for over a decade, was keenly aware that people learn best through stories that capture the heart and imagination, and he knew he needed help in bringing his idea to the big screen. For this help, he turned to award-winning Director Scott Cervine, who helped bring Austin’s emotionally compelling story and intriguing science to life, through his artistic arrangement of visual imagery, actor direction, and evocative music. Writer and Producer Austin began his career as a trial lawyer for one of the largest law firms in the world. He later went in-house with a Fortune 100 company where he served as General Counsel for one of their European divisions. In 2000, he resigned from his position to pursue his passion for changing lives. For the last decade, Austin, has been teaching personal leadership and the science and power of imagination to top rganizations and individuals across the country. Austin conceived the idea for People v. The State of Illusion as a way of illustrating the trial of life that each of us must go through. Based on his passion for “movies that matter”, Austin launched Exalt Films, a company committed to writing and producing films like his first, People v. The State of Illusion, designed to elevate and inspire the human spirit.